Are you dissatisfied with the price level that you currently pay for your precision castings? 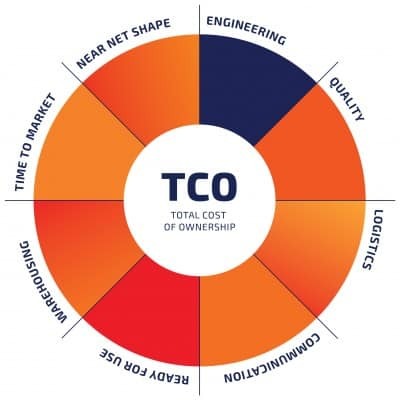 Do you think that your total cost of ownership (TCO) can be improved? Or do you think that price savings can be achieved by adapting the product design? Then please contact CIREX at no obligation. what can cirex mean to you? Often, the selection of a castings supplier is made on the basis of purchase price. This makes sense, since good procurement policy is the first penny of profit. Generally, related invisible indirect costs are not taken into account. These costs arise from, for example, long delivery times, the need to maintain large inventories, poor communications and/or poor product quality. As a result, the customer often pays much more in the long term than he expected. In other words: the lowest price can be expensive. Therefore, CIREX deliberately chooses to visualise all of the visible and invisible costs by using TCO. In this manner, you, the customer, always get an undistorted picture of the actual costs and are not faced with surprises later. With the clever setup of our organisation structure, we can reduce total costs for our customers considerably. In the Netherlands, CIREX has a completely automated production process. This translates into extremely low labour costs, but with extremely high and constant quality in the production of large series of precision castings. Smaller series are cast in our facility in the Czech Republic. Here, we have high-quality craftsmanship at relatively low wage levels. With this combination, we always produce at market rates. CIREX also thinks along with you as a development partner in order to achieve cost savings. These cost savings include savings in material costs, cutting out unnecessary machining processes, expensive heat treatments and unnecessary transport costs. This is an added value that CIREX offers to achieve a competitive price level. For those products that are produced in series for a longer period of time, a long-term vision concerning cost control is essential. Therefore, at CIREX, we work according to the total cost of ownership (TCO) philosophy.